Victoria BC Ska Society is excited to announce that Bananafish Dance Orchestra, Kutapira and Blackwood Kings will be playing on a triple bill on Saturday, September 20th at Felicita's Pub. This to be epic event is being presented by Victoria BC Ska Society in conjunction with the UVIC Ska/Reggae Club and sponsored by Lighthouse Brewery. We also would like to thank Felicita's Pub for their support on this event. This show is a bitter sweet one because it will be the last show Bananafish Dance Orchestra will be playing in Victoria for a long time. Lead singer Niall Harvery will be leaving BC for awhile so this show is more like a send off for the band. For those of you that have never seen Bananafish Dance Orchestra they would be best described as an 8 piece power house that will bring everything from-jazz to hip-hop, reggae to soul, Latin rock to ska--and anything else that will make you want to dance into the mix. 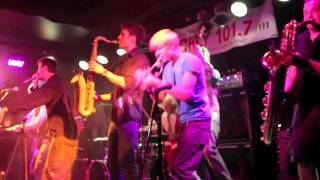 Bananafish Dance Orchestra that have played on numerous festivals including Kaslo Jazz Fest, Ska Fest and Islands Folk Fest are well armed with talented soloists, percussion jams, freestyle specialists, and even trumpet on trumpet battles! If you haven't heard or seen this band you are in for a sweaty affair. Vancouver's Kutapira brings Afro-Cuban vibes together with the melodies of Zimbabwe. They are one of the most entertaining, high-energy bands Vancouver has to offer. Born out of a forward-thinking educational initiative introducing youth to global rhythms, formed in 2005 through a Canada Council program matching professional artists and students, Kutapira have hardly had a chance to reflect on their achievements. Through the motivation and mentoring of Artistic Director, Jack Duncan and percussion maestro, Myles Bigelow, the group is forging new links between the traditions of Zimbabwe’s marimba music and the rhythmic soul of Afro Cuban drumming. Kai Buchan, Jeremy Bryant, Sangito Bigelow, Chris Couto and Theo Vincent are all fluent in both disciplines; rotating through their battery of soprano, tenor and baritone marimbas and trading licks on the drum kit, timbales and hand drums. The marimbas’ funky, wooden resonance isn’t the only buzz Kutapira is generating. The accolades from all corners have been swift in coming and the praise has been fanatical In the sometimes serious and stodgy world of world music, the quintet has been bringing a welcome injection of exuberance and velocity to festival stages, community events and concert halls in Canada and abroad, lifting people to their feet and rattling the cages of the uninitiated. Named after the Victoria BC street corner where the band rehearses, this is a group ready to make some waves. Laid-back reggae rhythms, odd time signatures, dueling guitar solos, slap bass lines, frantic jungle beats-- no musical idea is off limits, making live performances varied and energetic. Blackwood Kings has shared the stage with notable acts such as Vancouver's Giraffe Aftermath, Ghana's Paapa Wastik, Hot Rain from Hawaii, Canadian reggae legend Jah Cutta, and J-Boog from Compton, California.